New additions and updates to all Matrox product lines will be highlighted including video streaming and recording appliances, 4K video monitoring cards, multiviewers, live production streaming systems, scan converters, OEM products, KVM extenders and video over IP encoders/decoders. 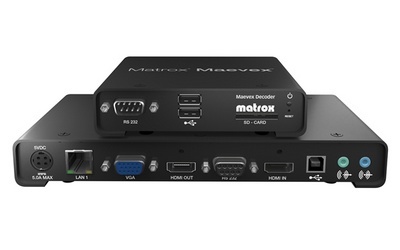 Matrox Monarch HD is a small, easy-to-use video streaming and recording appliance that received four important industry awards at the 2013 NAB Show. It is designed for professional video producers who need to simultaneously stream a live event and record a mastering-quality version for post-event editing. Priced at just $995 US (€799, £750), it provides these two independent delivery channels in an integrated unit. From any HDMI input source such as a camera or switcher, Matrox Monarch HD generates an H.264-encoded stream compliant with RTSP or RTMP protocol. While encoding the video at bitrates suitable for live streaming, Matrox Monarch HD simultaneously records a high-quality MP4 or MOV file to an SD card, a USB drive, or a network-mapped drive. 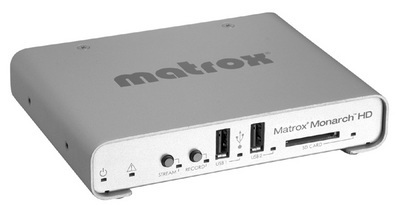 Matrox Monarch HD is remotely controlled using any computer or mobile device with a web browser. 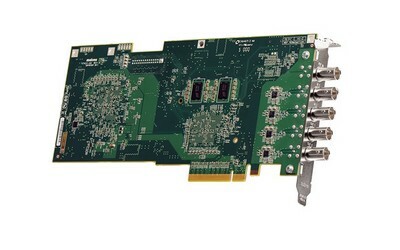 Matrox Mojito 4K is a quad 3G-SDI, 4K video monitoring card for use with Adobe Creative Cloud professional video editing and content creation tools on Windows platforms. It enables realtime monitoring and output of video footage at resolutions up to 4096 x 2160 and at frame rates up to 60 fps (4Kp60) so post-production professionals see every pixel of every 4K frame in real time to craft breathtaking content. 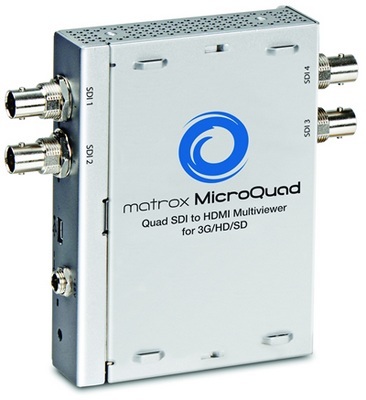 Matrox MicroQuad is a four-channel SDI-to-HDMI multiviewer for 3G/HD/SD at a breakthrough price. It lets broadcasters and A/V professionals use an affordable HDMI display to view up to four SDI video signals and show or hide labels and VU meters. Its powerful 10-bit scaling engine and advanced filtering algorithms ensure a crisp, artifact-free monitoring experience. MicroQuad can be controlled using buttons on the unit itself or from a distance using a Windows-based app. Matrox VS4 is a quad HD capture and ISO recording card for Telestream Wirecast for Windows live production streaming software. 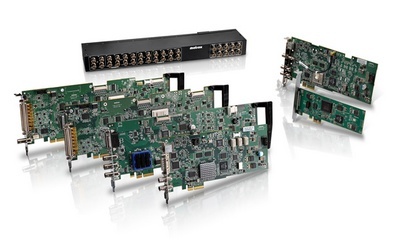 In a single PCIe slot, Matrox VS4 provides up to four independent HD inputs with up to 8 embedded audio channels per source. It not only sends video feeds to Wirecast for streaming, it simultaneously provides ISO recording of all the original video and audio feeds to disk — ready for post-event editing. 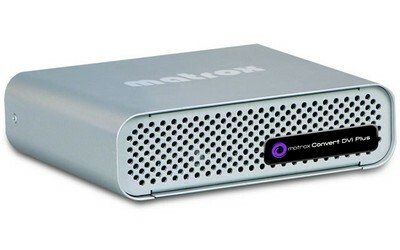 Matrox Convert DVI Plus is a cost-effective, genlockable HD-SDI scan converter that lets broadcasters easily and economically incorporate content from computers, iPads and iPhones into broadcast programs. It is ideal for creating broadcast-quality video from computer applications such as Skype, YouTube, Google Earth, FaceTime, ProPresenter, PowerPoint and web browsers. The region-of-interest feature lets the user define any region of any size from the computer display and output just that content at the required broadcast resolution. If the selected area doesn’t match the output resolution, Matrox Convert DVI Plus provides horizontal and vertical upscaling and downscaling. The unit can be genlocked to an SD analog black burst (bi-level) or HD tri-level genlock source. Proc amp controls on the output let the user adjust the hue, chroma, saturation, and brightness levels. In addition, Matrox Convert DVI Plus can be used to drive projectors and large displays at live events. Matrox DSX Developer Products combine a full range of multi-channel SD/HD/4K I/O hardware with the feature-rich SDK and unlimited engineering support that let OEMs create advanced channel-in-a-box, video server, broadcast graphics and live streaming equipment. 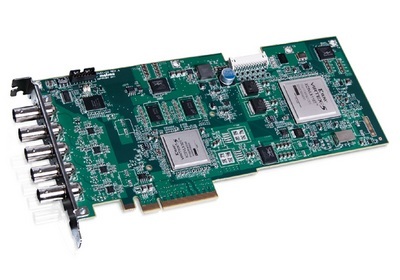 In addition to hardware that provides 24/7 reliability in even the most demanding environments, the Matrox DSX platforms provide advanced ancillary data handling for VANC and HANC, a constantly expanding selection of codecs (DVCPRO HD, MPEG-2, XDCAM HD AVC-Intra, H.264, Apple ProRes, Avid DNxHD, PitchBlue, and more), extensive file format support (GXF, MXF, MOV, AVI, MPG, MP4, and more) and powerful tools for quick app development. Matrox Maevex 5100 Series delivers excellent streaming quality at a fraction of the price of traditional encode/decode systems. Maevex video over IP solutions enable the extension of full-HD-quality video over standard IP networks for digital signage, collaborative video walls, manufacturing and automation, process control, and many other applications. Maevex encoders and decoders capture, stream, and decode video from a variety of sources, and even allow for software-based decoding on non-Maevex devices. Maevex units come bundled with PowerStream software, allowing for easy remote management of Maevex devices and enabling a wide variety of user-defined stream-management features. These include adjustable low bit-rate encoding for minimal and cost-effective bandwidth consumption.